A trustee's deed is used in trust administration to convey real property out of a trust. The trustee's deed is named for the person executing the deed, rather than the type of deed it is. 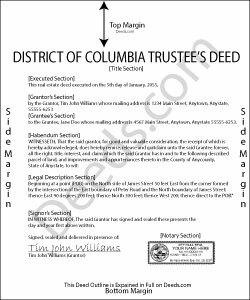 It is not to be confused with the statutory form of trustee's deed under a decree (D.C. Code 42:601), where the trustee is the assignee for foreclosure of a residential mortgage (D.C. Code 42:815.02(16)). There are three main parties to a trust. The trust is first funded by the settlor, who contributes assets to the trust. The trust's terms are established by the settlor in the trust instrument, which is usually not recorded (D.C. Code 19:1301.03(16)). Within the trust instrument, the trustee is appointed as the trust's administrator, and title to real property is vested in the trustee's name as representative of the trust. A trust beneficiary is anyone having a present or future beneficial interest in the trust (D.C. Code 19:1301.03(2)). The trustee cannot also be the sole beneficiary (D.C. Code 19:1304.02(5)). Under a power of sale established by the trust instrument, and under direction of the settlor, a trustee may convey trust property using the trustee's deed; the settlor is not named in the transaction. Rather, the trustee acts as the grantor to convey title to the grantee. Generally, the trustee will submit a certification of trust to prove the validity of the trust and their authority to act on behalf of the trust, since the trust instrument is not public record. At its most basic, the trustee's deed is a modified fee simple deed. It names the trust under which the trustee is acting, and gives the date of the trust's formation. As with all conveyances of real property, the deed requires a legal description of the subject property, and must include, the lot number, square, and subdivision, and the assessment and taxation number assigned to the parcel. The deed is signed by all acting trustees in the presence of a notary before it is recorded. Each case is different, and even a small mistake can cause problems. To ensure the intended outcome, seek legal advice for complex situations or with any questions.